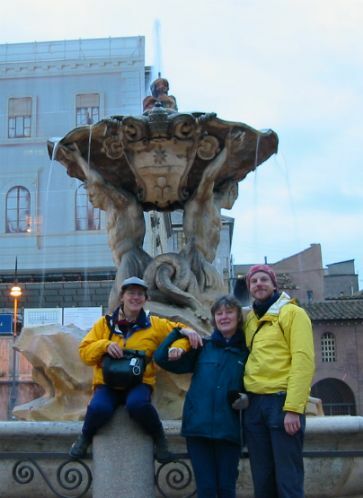 We got the train into Rome from Venafro, near Pozilli, and met my Mother at Ciampino airport. She had flown out with RyanAir for just sixty pounds return. For the next four days we 'did the sights'. Perhaps the most famous Roman building is the Colosseum. It was built in a mere eight years by an army of Jews captured from the fall of Jerusalem. Most of the surviving labourers then died during the opening celebrations, one hundred days of 'games' which took the lives of five thousand men and countless animals. It could seat 60,000 spectators. 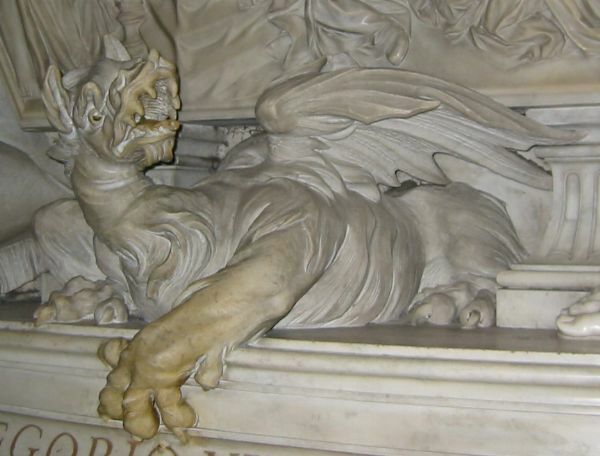 This is a lovely dragon on the tomb of Pope Gregory the 13th. This is the Pope who instituted the Gregorian Calander when the calendar had got so far out of sync with the sun that October 1582 had to be shortened by a whole ten days to bring them back into line. Many countries continued using the Julian calendar, particularly Britain which did not change until 1752. And now we think an hour's time difference is a nuisance when we cross the channel! 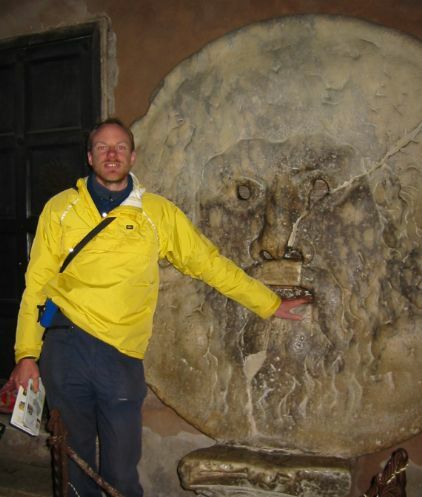 Fountain of Tritoni, Piazza della Bocca della Verita, and me with my hand in the Bocca della Verita (mouth of truth!). Supposedly if you tell a lie the mouth will close upon you! This bridge (the Ponte Febrizio) dates from 62BC. 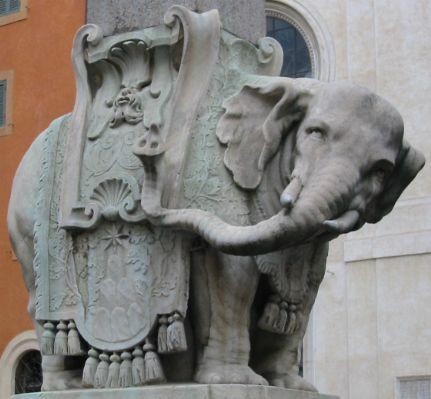 It has stood across the left branch of the Tiber for over two thousand years! The building which impressed me the most (I am an engineer you understand!) 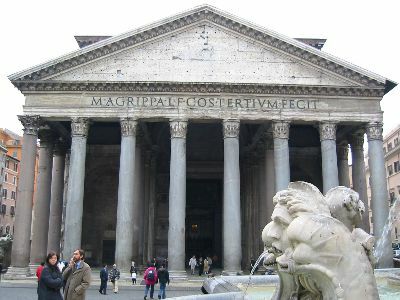 was the Pantheon, or temple to all gods. 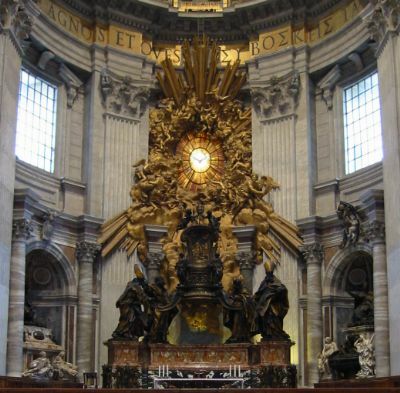 It was built in AD 118-125 and then converted to a church as soon as Rome became Christian. However it stands today largely unchanged from the original design as Hadrian built it. The key feature is the concrete dome which forms the roof, poured over a wooden mould with a central hole to admit light (and rain! ), it has stood untouched by weather and earthquake for nearly two thousand years. These photos show a strip from the ground up to the 'oculus' in the centre, and the entrance portico. And finally we saw this lovely obelisk. It is a combination of a small Egyptian obelisk (taken from Egypt by the Romans, lost and then rediscovered buried in the garden of the Santa Maria sopra Minerva monastery) and a sculpture designed by Gian Lorenzo Bernini in the 17th century.